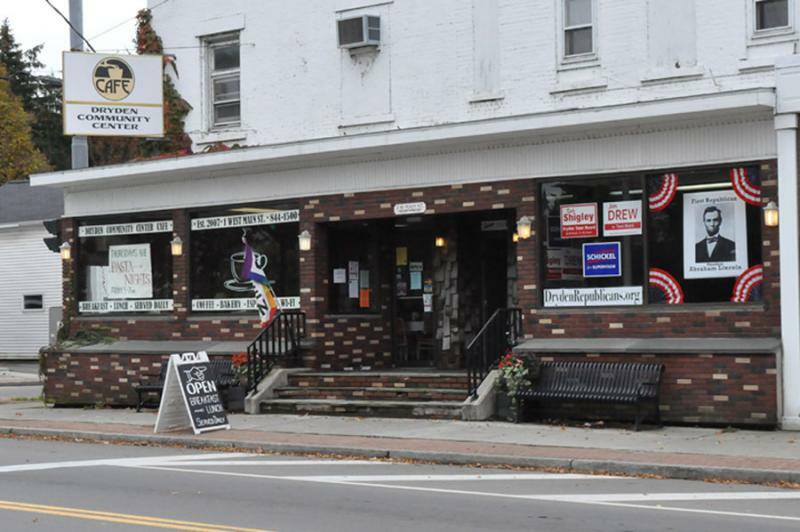 The fight over home rule and gas drilling is centered on downtown Dryden, N.Y. The fate of a ban on hydrofracking in the Town of Dryden hinges on an upcoming election. Technically, the ban's future rests with the judges that will hear a lawsuit brought against the town by drilling firm Anschutz Exploration. It's likely that the dispute about whether the state's authority to regulate drilling supersedes a town's right to say what goes on in its borders, will take years to sort out in the courts. But practically speaking, the ban could be overturned by simply rewriting Dryden's zoning law. And if Republicans sweep an upcoming election, Dryden could be in an odd position. That is to say: One of the very first towns to have its hydrofracking ban challenged by a driller, may not actually have a ban anymore. "I think one of the ironies from a political standpoint is it's often conservatives who argue for smaller government and local government," says Dryden Democratic Committee Chairman Jim Gustafson. "And this to my mind is a perfect example of local government saying we want control over something that would have such an impact on our quality of life." The Republicans in Dryden, led by their candidate for town supervisor, Bruno Schickel, haven't gone so far as to say that they would repeal the ban. "I think that's something that I certainly wouldn't take that position right now," Schickel muses, when asked about a repeal. "I think that I would have to evaluate that." Schickel is critical of town Democrats for putting Dryden out ahead of the push to ban fracking. "They essentially put a target on their backs, saying sue us first," he says. For him, the larger issues facing Dryden are excessive regulations and a mismanaged budget. The town is also rewriting its entire zoning code, a process that Schickel says was what compelled him to join the race. "What is the direction that Dryden is going to go," he asks. "Is it going to become this sort of exclusive, wealthy place or is it going to be a place that stays rural, stays for everyone?" Whether or not drilling will be allowed is central to those questions, says incumbent Democratic supervisor, Mary Ann Sumner. She's confident that the election will prove she took the right stance on drilling. "There are many Republicans that realize that this kind of gas drilling will change the town. We're not eager for that kind of change," she says. But it's unclear what people actually do think. There hasn't been any polling done about support for the ban, or to gauge whether sentiment about the ban has changed now that there's a lawsuit. That uncertainty has focused more attention than usual on the race for town supervisor. The most recent campaign finance filing from the Dryden Democratic Committee shows that Sumner's campaign has four times more cash at its disposal than it did during her last contested election. But Jim Crawford, head of the Republican Party in Dryden, says the town's history of waffling between Democratic and Republican majorities - combined with what he says is overreaching on the ban by Democrats - will make this year's race very close. "[The Democrats are] arrogant because they presume to know what's best for the general public," he says. "They're aloof because they don't take the time or make the effort to find out whether the public are on board with their significant regulations for the future of this town." Like any other small town with an election on the horizon, Dryden is plastered with lawn signs. Mailboxes are flooded with mailers, and door-to-door campaigners are stopping by at dinner time. Both sides have even considered meeting for a debate, but details haven't yet materialized. On the surface, it's a run-of-the-mill, hotly contested election - a normal, every day campaign that only has the potential to set statewide precedent, and rewrite the rules about drilling and home rule. There's a showdown brewing in Dryden, New York. Back in August, the town passed a zoning ordinance that banned the practice of hydrofracking for natural gas. A month later, they were being sued by gas company Anschutz Exploration. Can you, or can't you, ban drilling within your own town limits? Updated: The suit has been filed. You can read it on Scribd. Denver-based Anschutz Exploration Corporation announced Thursday that it will challenge the town of Dryden's ban on hydrofracking in state Supreme Court. Anschutz applied in 2009 to drill a horizontal well in Dryden and the application remains open, according to the Department of Environmental Conservation's wells database. While the first well in Dryden was drilled in 1941, the town board voted to ban all natural gas operations in August. Another town ban on natural gas drilling is being challenged in court. Just one day before the Town of Dryden was sued by driller Anschutz, the Town of Middlefield in Otsego County was the subject of a lawsuit. Jennifer Huntington, a dairy farm, brought the suit against the town board on September 15. She claims that the town's ban on gas drilling violates New York state law. The town's law - and the argument against - it are nearly identical to the Dryden case.